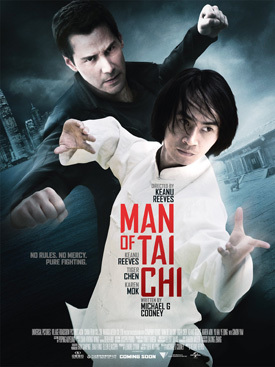 Tiger Chen, Keanu Reeves and Karen Mok star in the martial arts action movie Man of Tai Chi. See the movie trailer, cast, plot and release date below. Set in modern Beijing, Man of Tai Chi marks Keanu Reeves’ directorial debut. The film, also starring Reeves, follows the spiritual journey of a young martial artist (played by Tiger Chen) whose unparalleled Tai Chi skills land him in a highly lucrative underworld fight club. As the fights intensify, so does his will to survive. MPAA Rating: (R) for violence. Set in modern Beijing, MAN OF TAI CHI marks Keanu Reeves’ directorial debut. The film, also starring Reeves, follows the spiritual journey of a young martial artist (played by Tiger Chen) whose unparalleled Tai Chi skills land him in a highly lucrative underworld fight club. As the fights intensify, so does his will to survive.